​ In 1965, a small group of music educators in Central Illinois gathered to discuss plans for an organization to serve musically talented youth and their communities. It began when J. Elmer Szepessy, then Orchestra Director at Peoria High School, and Patricia Hackler, founder of the Suzuki Program in Pekin, approached Dr. Mark Bills, who was Superintendent of Peoria Public Schools, with an idea to establish a high school for the arts. Instead, it was decided to develop a performing arts organization, which would draw together the best of area high school musicians for an experience beyond that which could be offered in high school. As a result of support from Peoria Public Schools, Bradley University, University of Illinois, the American String Teachers Association and countless hours of work by people committed to the concept, Central Illinois Youth Symphony held its first auditions in October 1965. The debut concerts were in Peoria and Pekin in 1966. As did the young people of that first orchestra, those in succeeding years have come from large and small communities in a wide area of central Illinois. Donald Miller, Assistant Professor of Music, University of Illinois, was conductor for the first season. After the successful launching of the orchestra, the baton went to David Daniels, Assistant Professor of Music at Knox College, Galesburg. 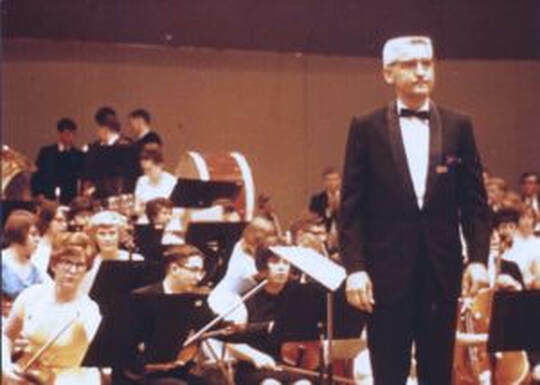 In 1968, J. Elmer Szepessy, who had been in the charter group that formed Youth Symphony, became conductor, as well as serving as coordinator of Music in Peoria Public Schools and Orchestra Director at Richwoods High School. In the fall of 1978, William Wilsen, Associate Professor of Music at Knox College, began conducting the Youth Symphony, and continued until 1982. Jack Ranney, on the music faculty at University of Illinois, directed from 1982 to 1991. Steven W. Eggleston, Professor of Music at Illinois Wesleyan University in Bloomington, directed the Orchestra from 1992 until 1998. Steven Huang, the Music Director of both the University of Chicago and Bradley University Chamber Orchestra conducted from 1998-2003. David Commanday, then PSO Music Director, conducted from 2003-2009, with Brian Dollinger taking over in the fall of 2009 thru April 2012. Dr. Glen Block, Professor of Conducting and Director of Orchestras and Opera at Illinois State University, conducted the Youth Symphony from 2012-2014. In 2014, Dr. Timothy Semanik of Bradley University served as an interim conductor, and in the fall of 2015 CIYS welcomed David Commanday back to the podum. Maestro Commanday continues to lead CIYS as our Music Director. Realizing the enthusiasm young musicians showed for Youth Symphony, the Board of Directors saw the need to expand the musical opportunities and provide a training ground for orchestra personnel with the establishment of Prep Orchestra in the autumn of 1970. Glen Sanderson, Orchestra Director in East Peoria, was the first director of the preparatory group, which progressed from a string ensemble to a full orchestra. Peter Wessler, Orchestra Director for Peoria Public Schools, became its second director in 1981. The Prep Orchestra underwent a name change and became the Central Illinois Concert Orchestra in 1983. Melissa Siebenthal, Director of Orchestras for Normal Unit 5 School District, Normal, IL, retired after 10 years as conductor of the Concert Orchestra. Philip Rudd began conducting this orchestra in the fall of 2008 and finished his last concert with CIYS in November 2016. Beginning in January 2017 Dave Getz, Orchestra Director at Morton High School and CIYS alum, will conduct Concert Orchestra. In 1995, a new Preparatory String Orchestra was formed, as a result of workshop and operating grants from the Illinois Arts Council and Peoria Area Arts and Sciences Council. As a string orchestra, it meets the needs of young musicians in their first advanced setting. Betsy Jones, Peoria District 150 Orchestra and Carmen Diagostine, then orchestra director for Normal Public Schools shared the debut season baton. Betsy Jones conducted Prep Orchestra until November 2012. From that point forward, Prep and Reading Orchestras have been conducted by Rosemary Ardner, Orchestra Director in the Dunlap School District and freelance violinist. In 1997 the first of the organization’s small ensembles was formed. The Percussion Ensemble, conducted by Peggy Bonner, was formed from the Youth Symphony and Concert Orchestra percussionists to provide additional challenge and highlight their talents. In January of 2006, a Brass Ensemble was formed with the brass students from the orchestras, under the direction of Craig Fitzpatrick. In the fall of 2008, Brad Harris took over as conductor of the ensemble. January of 2008 saw the addition of a Flute Choir under the direction of Becky Schutte, Clarinet Choir and Woodwind Quintet under the direction of Sherill Diepenbrock, and string quartets first coached by David Commanday, Jane Hoffmire and Marcia Henry Liebenow and now under the sole direction of Jane Hoffmire. In the fall of 2009, CIYS added a Brass Quintet founded by Brad Harris, now coached by Dr. David Snyder. Since this time, small and chamber ensembles of various sizes and makeup have performed as part of CIYS programs. In 2017 the board of directors voted to update the name to Youth Music Illinois to break down student and parent perception barriers while projecting stronger, more expansive and inclusive opportunities for the future.